The beautiful Roseland Peninsula is arguably one of the most picturesque and unspoilt parts of the Britain and is renowned for its superb scenery. Known in Cornish as Ros, meaning promontory, to the north west tyhe peninsula consists of woodlands and creeks, while the south east has rocky cliffs. The beaches around the Roseland Peninsula, as with the rest of Cornwall, are the cleanest in the country and even during the summer months remain relatively uncrowded. A busy and characterful fishing village, Mevagissey is a captivating place with a charm and atmosphere all of its own, it is one of the oldest fishing ports in Cornwall. The village is a fascinating labyrinth of ancient narrow streets containing quaint shops, the streets, lined with characterful, old slate roofed cottages, radiate out from the village's harbour. 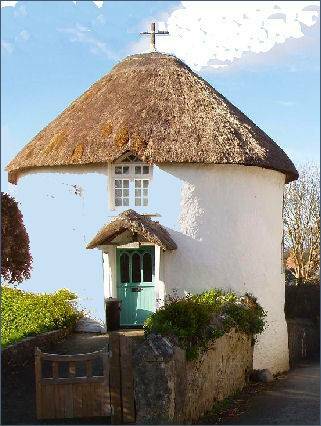 The are many attractive villages and hamlets on the Roseland Peninsula, such as the twin villages of Gerrans and Portscatho. Portscatho was once famed for its pilchard fishing while Gerrans features a church spire, a well known as a landmark. There are are many fine beaches in the area such as Towan and Porthbeor as well as the attractive hamlets of Porth and Bohortha. The South West Coast Path passes through the centre of Portscatho, the coastal walk to Nare Head from Portscatho offers superb views. Tregony was a thriving port prior to the river silting up, its wide main street, featuring a recently restored clock tower, is known as the gateway to the Roseland. The delightful village of St. Just in Roseland offers a good range of facilities. There are tidal beaches and anchorage for boats along the shoreline. The ancient church of St. Just the Martyr, which occupies the site of a fifth century chapel, is said to be the most beautiful church in the county, and stands above St. Just Pool, a wooded inlet, just outside the main village. The ancient church of St. Just the Martyr, which occupies the site of a fifth century chapel, is said to be the most beautiful church in the county, and stands above St. Just Pool, a wooded inlet, just outside the main village. The church dates from the thirteenth century and was dedicated to St Just on 14th August 1261, by Walter, Bishop of Exeter. The small town of St.Mawes situated at the southern end of the peninsula and looks out over the River Fal to Falmouth. 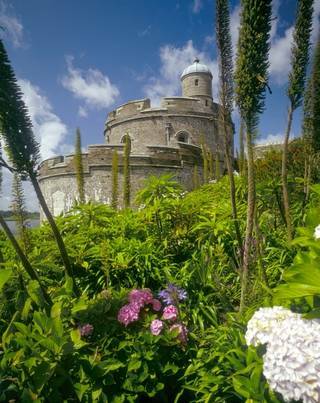 St. Mawes Castle (pictured right) stands on the seafront, and is among the best-preserved of Henry VIII's coastal artillery fortresses, and the most elaborately decorated of them all. One of the chain of forts built between 1539 and 1545 to counter an invasion threat from Catholic France and Spain. The castle consists of three huge circular bastions (like a clover leaf) it was built in the sixteenth century by the formidable King Henry VIII. Pendennis Castle occupies the opposite headland to enable their joint cannon to cover the entrance to the Fal estuary. Set in a sheltered valley and warmed by the Gulf Stream the Lost Gardens of Heligan contain many rare and exotic plants and cover eighty acres in all. The Lost Gardens of Heligan are now one of the most popular in Britain. Lamorran Gardens is situated off the Upper Castle Road in St. Mawe's. The stunning 4 acre sub tropical garden at Lamorran House is in a set in a stunning position with superb sea views to St Anthony's Headland and was featured in the Nation's Favourite Gardens programme by the BBC in 2002. Trewithan Gardens, described as "perhaps the most beautiful woodland garden in England" are situated at Grampound, on the northern edge of the Roseland Penninsula. Poppy Cottage Garden at Ruan High Lanes near the hamlet of Ruan Lanihorne is an enchanting 1 acre cottage garden which is a gardener's paradise. Porthluney Cove has a pleasant aspect, it has a sheltered and south facing sandy beach with a convenient adjoining car park. Nestling in a sheltered valley overlooking Porthluney beach, Caerhays Castle was converted from a medieval manor house in the early nineteenth century by John Nash, architect of London's marble arch. In the Early Middle Ages, it belonged to the Arundell family. The earliest recorded mention of the name occurs in 1259 when it was referred to Karihaes. The lovely village of Veryan, mentioned in the Domesday Book of 1086, features unique thatched circular cottages at its entrance, (pictured left) legend states they were built without corners so there was nowhere for the Devil to hide! 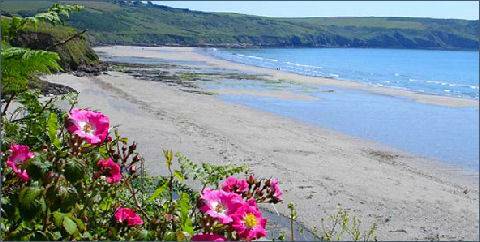 Veryan has a number of good beaches nearby, including Carne Beach, Pendower Beach, East and West Portholland beaches. Carne Beacon, lying a mile from Veryan, is said to be the burial place of the Cornish saint, King Gerennius. Local legend states that the burial mound contains the golden boat with silver oars, on which his body was brought across Gerrans Bay. The small and unspoilt Cornish coastal village of Portloe, located around twelve miles from Truro is considered by many to be one of the most attractive villages on the Roseland peninsula. The village, described by the Poet Laureate Sir John Betjeman as "One of the least spoiled and most impressive of Cornish fishing villages", lies in a superb location at the foot of a steep valley leading into beautiful Veryan Bay. In the village above the harbour a winding narrow street climbs up the hillside past the quaint stone cottages up to the inn. Dating from the seventeenth century, the Portloe Lugger's Inn, at the top of the harbour slipway, was once reputed to be the haunt of Cornish smugglers and dates back to the seventeenth century. Smuggling, as elsewhere in Cornwall, has played its part in Portloe's history. The peaceful peninsula is much loved by walkers and offers a variety of scenic coastal and inland walks. Exotic plants thrive in Cornwall's mild climate, Roseland is home to Mediterranean style Lamorran Gardens and Poppy Cottage Garden, an inspirational plantsman's garden. Melinsey Mill, near Veryan, is working museum with tea rooms in a restored water mill and is well worth a visit. The Roseland Visitor Centre is situated in St Mawes in the Main Car Park, behind the Rising Sun.